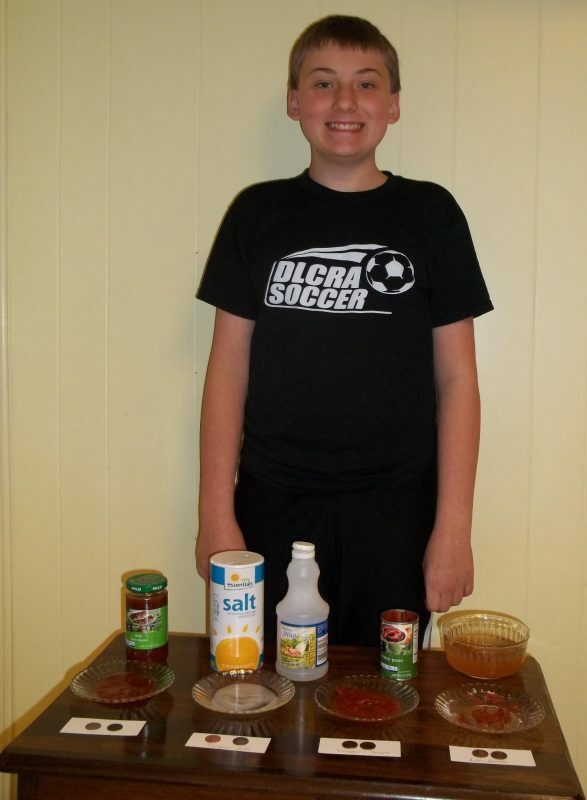 Logan, a homeschooled 6th grader, explores the benefits of taco sauce as a cleaning agent in his Taco Sauce Science Fair Project Abstract. Does taco sauce clean pennies, and if so, what ingredient does the cleaning? I think that taco sauce will clean the penny. I hypothesis that it is the tomato paste in the sauce that will clean the penny instead of the salt or vinegar. Victor Benue designed the first penny to contain 0.950 copper and 0.05 tin and zinc. Since 1982, pennies have been made 0f 17.5% zinc core and 2.5% copper plating. Pennies tarnish when the copper is exposed to oxygen, moisture, and oils from our fingers. According to Steve Spangler, taco sauce will clean a penny. My experiment is to see if that is true, and if so, what ingredient does the cleaning. According to the taco sauce label, taco sauce contains salt, tomato paste, and vinegar. Try cleaning the penny with taco sauce. Separate ingredients of taco sauce. Clean penny with each ingredient. Then mix two ingredients at a time and try again. According to my experiment, taco sauce will clean a penny. Tomato paste, salt, and vinegar alone will not, however. I then mixed two ingredients at a time and found that the salt and vinegar mixed together in taco sauce is what cleans pennies. My hypothesis was that taco sauce will clean the penny, and it would be the tomato paste in the sauce instead of the salt and vinegar that actually did the cleaning. My experiment partially supported my hypothesis. The taco sauce did clean the penny, but it was not the tomato paste that did the cleaning, it was the salt and vinegar mixed together that did the cleaning. Yeoman, R. S. A Guide Book of United States Coins. Western Publishing Co., 1992. This entry was posted in abstracts and tagged easy science fair projects, penny cleaning science experiment hypothesis, penny cleaning science fair project, taco sauce ingredients, why does taco sauce clean pennies.